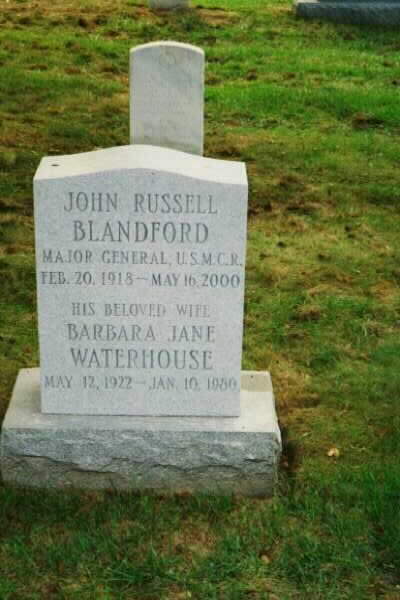 John Russell Blandford, Major General, United States Marine Corps (Retired) entered into Eternal Rest on May 16, 2000. He was the husband of Betty Blakely Blandford of Seabrook Island, SC. Burial services to be conducted in Arlington National Cemetery with full military honors on Wednesday, May 24, 2000 at 11 a.m. In lieu of flowers, memorials may be made to the First Marine Division Association Scholarship Fund, 14325 Willard Rd., Suite 107, Chantilly, VA 20151-2110 and/or Johns Island Presbyterian Church, 2550 Bohickett Rd., Johns Island, SC 29455. SEABROOK ISLAND - Retired Marine Corps Reserve Major General John R. Blandford, 82, a former chief counsel for the U.S. House Armed Services Committee, died Monday. The memorial service will be at 11 a.m. Saturday in John's Island Presbyterian Church. Burial will be at a later date in Arlington National Cemetery with military honors, with local arrangements by Stuhr's Downtown Chapel. General Blandford was born in Buffalo, New York, a son of Raymond Blandford and Mary Blandford. He was a graduate of Hobart College in Geneva, N.Y., where he was a Phi Beta Kappa, and Yale University Law School. He was commissioned in the Marine Corps Reserve while in college and was called to active duty in 1941. During World War II, he served with the 1st Marine Division in the Pacific in the Tulagi-Guadalcanal campaign and the Cape Gloucester-New Britain campaign. He received the Legion of Merit, the Navy Unit Commendation Medal and several service and campaign decorations. He was released from active duty after the war but remained in the Marine Corps Reserve. General Blandford became counsel for the House Armed Services Committee in 1947 and chief counsel in 1963. He worked for the late 1st District Rep. L. Mendel Rivers, D-Charleston, during Rivers' tenure as committee chairman. He retired from the post and the Marine Corps Reserve in 1972. Former 1st District Rep. Mendel J. Davis, D-Charleston, said General Blandford "was one of the greatest people I've ever dealt with and one man who really took care of the military. He was exceptional, working with Rivers on problems dealing with Vietnam, the My Lai massacre and the procurement of the C-5A jet transport. He was truly a dedicated American." Retired Marine Colonel Myron Harrington of Charleston said General Blandford "was one of the people who worked behind the scenes to keep the Marine Corps in the forefront of our nation." He later worked as a private legislative consultant on matters relating to the military, especially active-duty members. He received the Rockefeller Public Service Award and the Distinguished Public Service Awards from the Army, Navy and Air Force. He was an honorary member of the Fleet Reserve Association. He was a pioneer of Seabrook Island and a board member where he served in many capacities. Surviving are his wife, Betty Blakely Blandford; a daughter, Marcia Ann B. Hoener of Norcross, Georgia; a brother, Clinton P. Blandford of Clinton, Iowa; five stepchildren; 11 grandchildren; five step-grandchildren; and a great-grandchild.